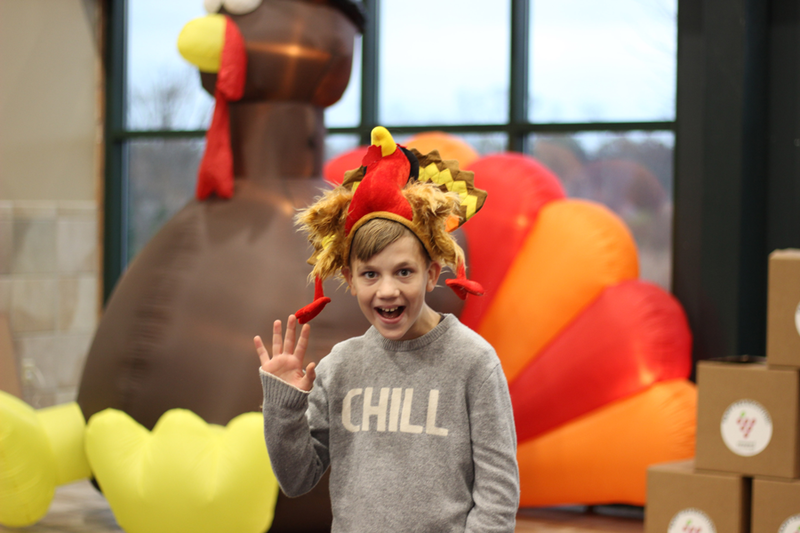 Come to the November Serve Saturday for TurkeyFest! Turkeyfest is an annual event that brings people together to show God's love in a powerful way. As the Church, we show Christ’s love in a HUGE way by demonstrating our thanks to God through giving to families in need. You can participate by picking up a box during any service on the weekends of Nov. 3 & 4 and Nov. 10 & 11. Just fill your box with a Thanksgiving meal, and bring your filled box back to the Vineyard on Saturday, Nov. 17 at 9am. Get the shopping list. We'll celebrate what God is doing throughout our whole community! We'll come together for a delicious free breakfast, pray, and then go out and deliver our meals to people all over the city. We'll provide you with the names and addresses of people who you can serve unless you've already chosen who you'd like to deliver your box to. There will be Turkeyfest veterans on hand who you can team up with! If you can't personally deliver it that day, donation drop-off stations will be set up and ready for you after each service on Nov. 17 & 18. Pick up a box to fill from any Info Area during weekend services, Nov. 3 & 4 or Nov. 10 & 11. You'll find a shopping list and some guidelines on what to do attached to the box. Pull together your family, friends and small group and go shopping! Have fun and make a game of it! See the shopping list for tips on what to include in your box. The shopping list below is a general guide of what to include. You can also fill the box with a few of your family’s favorites (such as sweet potatoes, collard greens, chips or cookies), because — let’s be honest — turkey takes a long time to cook and snacks are a good thing! Please include both the invitation to Vineyard Cincinnati Church and the Healing Center info sheet in the box for the recipients! Feel free to decorate your box in some creative way, or just write some inspirational words to the family you’ll be serving. It’s a nice touch and gets the kids involved! The goal here is to pack your Turkeyfest box with as much love as possible! We'll gather for a free breakfast starting at 9am in the Atrium. Just leave your box in the car during breakfast. Can't stay for breakfast? Feel free to drop your box off at the Turkeyfest tent starting at 9am. If you can't stay to personally deliver your box on Saturday, Nov. 17, we'll have donation drop-off stations set up and ready for you after each service on Saturday, Nov. 17 and Sunday, Nov. 18. Donations collected will be distributed to families in need. Show others how you shop or get the kids involved! Post your photos on our Vineyard Cincinnati Facebook and Instagram pages or just tag Vineyard Cincinnati. Use #vccturkeyfest.